Home / Campaigns / What are Campaigns and how do I use them? Note: There is a limit of 50 user properties that can be configured. Once they’ve been configured there is no way to delete or archive old user properties. 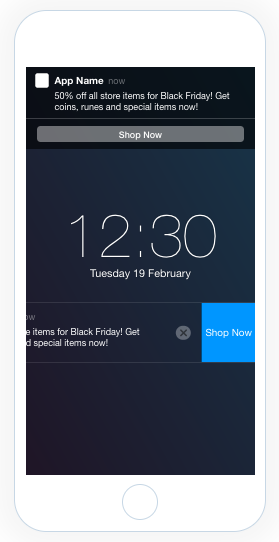 The best practice is to test campaigns with a test app. Once validated you can configure the user properties with your production apps. 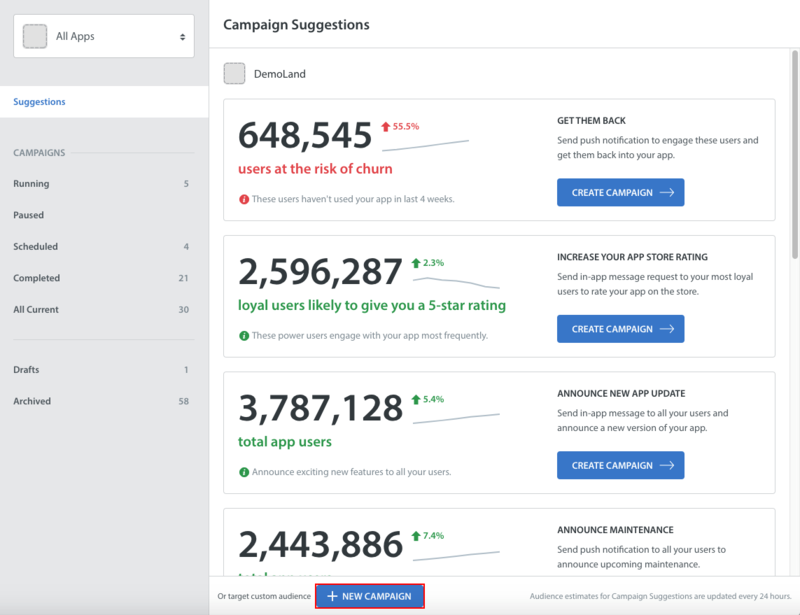 Campaigns allow you to proactively send a message (in the form of a push notification or in-app message) to any user who has your app installed on their device. They can be used to encourage user re-engagement, announce app version updates, request highly engaged users to review your app in the app store, and more. 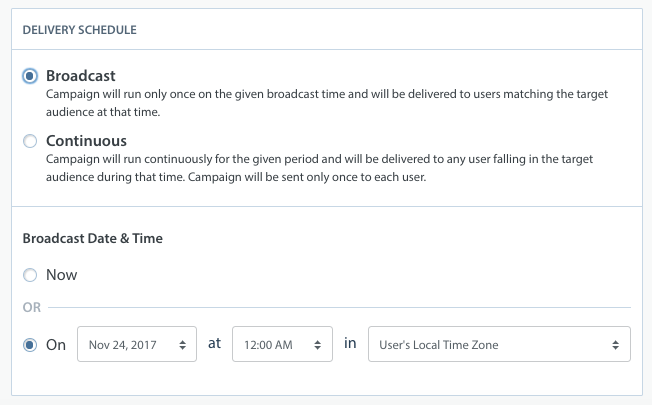 Helpshift offers two types of Campaigns: Broadcast and Continuous. Broadcast Campaigns are best for special events, such as a holiday promo or a large sale, where you may wish to send a one-time notification to users about the event. Continuous Campaigns are meant for Campaigns that always target select users at select times, such as a notification that is sent to a user when they hit $100 in spend or if they haven’t opened the app in over a week. If your users tend to drop off at a certain point in your app, you can use a Continuous Campaign to proactively reach out to future users before they do the same thing. If you need to alert your users about a new feature and direct them to an FAQ explaining what it does, you can use a Broadcast Campaign to reach all current users. They’ll be able to open the FAQ directly from the push notification, thus launching your app and re-engaging them. What content will be in your message. Keeping it short and simple is best – your notification will likely be competing with other notifications for attention, and should catch the users eye to make them want to click it first. What action should occur when the message is tapped. Possible actions include opening the app, opening a Helpshift FAQ article inside the app, opening the App Store rating screen, and more. Who to target, e.g. the type of user you want to send the Campaign, will depend on what kind of action you want users to take. For example, if you want to get inactive users to re-engage with your app, you should target users who haven’t opened the app in a certain amount of time. Other possible options include: all iOS users; users who hasn’t yet installed the most recent app update; users who have opened the app in the last week; users who have had an item sitting in their shopping cart for a day or more; and many other options. How often to send the Campaign – Campaigns can be scheduled at 5 minute intervals. Whether you want to send the message out as a Broadcast Campaign or a Continuous Campaign. To learn more and review some examples, see Should I run Broadcast or Continuous Campaigns? To set up your first Campaign, navigate to the Campaigns page by clicking the megaphone icon on your Dashboard. By default, you’ll land on the Suggestions tab. Metrics for analyzing your risk of churn, loyal users and total users for each of your apps are visible on this page. You’ll also see options to review all running, paused, scheduled, completed, drafted, and archived Campaigns in the left navigation bar. To create new Campaign, click the ‘+ New Campaign’ button at the bottom of the page. On the page that appears, start by entering your Campaign title, type, type, and the app it’s for. In the push notification > notification message & action section, enter a message for your Campaign and select a primary action. 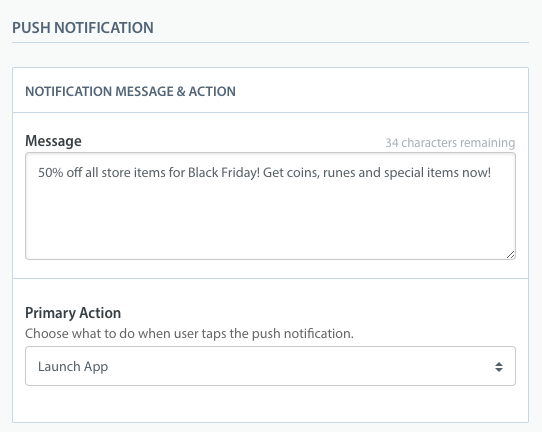 The primary action is what occurs when your end users click on the push notification generated by the Campaign. Please note: the message field is mandatory. The Campaign preview on the right side will live update with the selections you make. In push notification > notification buttons, select the notification button you want to appear with the Campaign (if any). You may also select a custom notification sound from this page. For Campaign delivery, select the target audience you’d like to direct this Campaign to using the ‘users with’ drop-downs. For example, you could choose to target iOS users who haven’t opened the app in 3+ days. New drop-downs will automatically be added per your selections. If you wish to have your Campaign to out to all of your end users, you may simply leave this area blank. Your estimated target audience will automatically recalculate at the bottom of this section. Last, you’ll need to select the delivery schedule, Broadcast or Continuous (defined at the top of this page). Depending on your selection, you will also need to select either the Broadcast date and time or the start and end time for a Continuous Campaign. To launch your Campaign, click the ‘Save & Publish’ button in the top right corner of the page. Unless you selected ‘Now’ for the broadcast date & time, the Campaign will not start begin until the start time indicated. What do the different Campaign Actions do?